Kotor is a coastal town in Montenegro located in the most secluded part of the Boka Kotorska (Bay of Kotor). The old port town, or Stari Grad as it’s locally called, is a UNESCO-designated “World Natural and Historical Heritage Site” and one of the best-preserved medieval towns in the Mediterranean. Its impressive walls climb up the sides of very steep hills and zigzag at incredible angles above the town. O ld Kotor is full of quaint alleys and cozy squares to discover and wander. A visit to Kotor should include a trek up to St. Ivan’s fortress, located 280 metres (918 feet) directly above the town. You simply cannot allow yourself to pass up the view, which must be experienced firsthand, and then noted and photographed. A word of caution — the walk up is steep and only advisable for those physically fit. 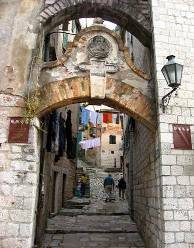 The climb up to the fortress starts under an ornamental gate at the east end of Old Kotor. There is a small fee to access the trail. Don’t forget your camera, a hat and drinking water. At times, an enterprising individual from town carries refreshments and light food up to the top. But this is a hit or miss affair, so pack accordingly. The town has not yet developed as a major tour destination, so most of the walkers up to the castle are locals. The route follows the town’s ramparts first started in the Illyrian age and then built and rebuilt up to the 18th century. The beginning of the ascent twists back and forth up the embankment but is relatively safe. Further up the walk, the trail becomes steep and poorly maintained, making it treacherous in places. Erosion, earthquakes, and vegetation, plus lack of repair, have contributed to its ongoing decline. At one point there is a crossing over a high ravine by means of a rickety metal bridge, which might just make you look up when crossing to avoid seeing the drop below. There are very few rest places, so stop as needed, particularly on hot and humid days. About halfway up, you’ll see the Church of Our Lady of Remedy positioned on a towering ledge. The church was built by those who survived the plague in the 14th century. The views from this vantage point are amazing, making it a good place to take a rest. The trail continues the arduous climb for another 30 minutes to the very top and to St. Ivan’s fortress, an Illyrian fort built in the 3rd century. 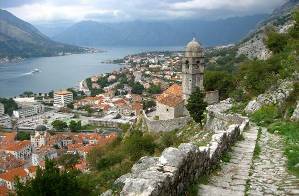 There, the castle ruins dominate the eastern end of the bay, the fortification system and Kotor. The views from this loft of the surrounding mountains are breathtaking, and Kotor’s triangular-shaped old town below looks more like a miniature town from “Gulliver’s Travels” than the real thing. The Boka Kotorska, one of the most indented parts of the Adriatic Sea, is sometimes called the southernmost fjord in Europe, although it is actually a submerged river canyon. With the nearby overhanging limestone cliffs of Orjen and Lovcen one of the great Mediterranean landscapes is created. 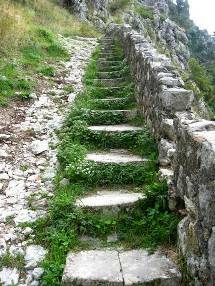 The walk back down to Kotor is relatively easy, although it can give your knees a beating. Once at the bottom, Kotor offers places to relax and refuel, and to appreciate the trek just completed. If you plan to be in Montenegro, visit Kotor and take a walk up to St. Ivan’s fortress before the crowds come. You will be rewarded more than words can describe. The total trip should take about 2 to 2 1/2 hours, including a photography stop at the top. In recent years, Kotor has seen a steady increase in tourists attracted by both the natural beauty of the Boka Kotorska and the old town of Kotor itself. Kotor lies at the head of the Boka Kotorska, more than 20 miles by water from the Adriatic coast, and is connected to the rest of the coast and inland Montenegro by motorway. Tivat Airport is 5 kilometres away and has flights to Belgrade and Zurich, and charter planes during the summer season. Podgorica Airport is 65 kilometres away and has connections to major European destinations throughout the year. If you’re interested in purchasing this article for your publication, click here to contact the author directly.